I’ve on my 2nd 12 week course at SkandiHus and loving every minute. The studio has a friendly and relaxed vibe. 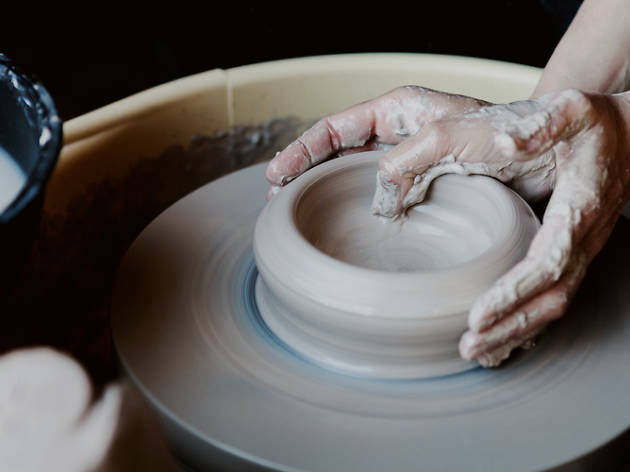 The first few sessions are structured, you’ll be taught the core skills and techniques which you’ll apply to your own projects - everything from preparing clay, hand building, working with molds, throwing on the wheel, trimming, glazing and much more. If you take the class again, you’re free to build on your skills while the rest of the class learn the basics - this flexibility is great. Chris teaches my class, but I’ve also had classes with Ania, Karina and Stine’s tuition when she’s been in the studio. They’re all incredibly knowledgeable, encouraging and genuinely interested in your journey! We went for a team bonding activity and had such a great time! Karina, who taught the class, gave us insight into the different techniques, as well as freedom to build our own things. I'd highly recommend as a work activity to have some fun with the team and learn something new! I've been going to SkandiHus for weekly classes for about a year and a half now and I can't recommend it enough. The classes are at a steady pace with a flexible structure, so it's perfect for complete beginners and for those with more experience too. The instructors are always nurturing and have good advice, without being controlling. These couple of hours are great for unwinding and leaving everything else behind, and just focusing with like-minded people. I've been lucky to make some great friends there too - you get to meet a lot of interesting people from different backgrounds, all brought together by a love of clay! I'm onto my 2nd course now and just love it. I look forward to those couple of hours of creativity every week. Its a time when I leave the day behind and think of nothing else but the clay. The class takes place at the Skandihus studio which is filled with Stine's beautiful pieces... its such an inspirational place. The instruction and atmosphere is relaxed and my fellow potters, are a great group of people ... I couldn't recommend it enough. Took the taster session a few weeks ago. After working in an office all week, spending a few hours in this beautiful studio space, working with my hands, and letting the creativity flow was lovely and relaxing. Instruction was great to learn the basics but not overly regimented - we were also given plenty of time to try our own ideas and styles. Loved it so much I just signed up for the 12 week course! I have only started learning to work with clay six months ago with Skandihus, and have loved it since day 1, and have been back every Saturdays and Sundays (on my third round of the 12 week course). The studio is beautiful and calming and that's the way I like to spend my mornings on the weekend now. Our teacher, Karina, has been the most wonderful and patient with her students. The 12 week course covers a lot of the knowledge and skills (both hand building and throwing on a potters wheel) you would need to work independently in a communal studio. Through practice with the right guidance from our teacher, you can really see a lot of improvement in a few months. I also highly recommend the open Sunday drop-in sessions, these are good for practising at your own pace or working on your own project, they are very flexible as there is no commitment to pay a fixed membership fee or joining a waiting list like many other studios in London. I’d highly recommend the Sunday afternoon taster session at Skandihus. As a complete beginner I found it great! Our teacher had a very relaxed approach, explaining all the basics, letting us make what we wanted whilst giving us advice and help when needed. 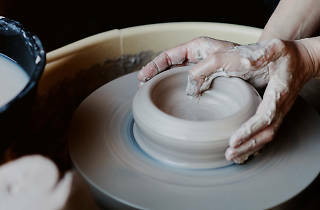 I never expected to find pottery so therapeutic, I’m planning to sign up to a 12 week course! I've been going to Skandihus Pottery Classes every Wednesday for over a year and love everything about it. Stine is an amazing teacher and I've not only made some great friends but am now starting to make some pieces that I really love. A few hours in the pottery studio is the highlight of my week and is a fantastic way to focus on something rewarding away from work and busy London life.